Teachers and parents alike know how hard it can be to motivate kids after a snow day. We had a snow day here last week, and my children definitely would have stayed home to work on their snow fort or gone snowboarding instead of going to school the next day, given the choice. Ken Brummel, a middle school science teacher in Newport, New Hampshire, found a way to work with those desires, rather than against them. Brummel told his students to come back from their day off prepared to spend their classtime outdoors. First they created snow sculptures. Not snowmen — instead, they represented some of the science that they’d been learning. One group of 7th graders created a sloping ramp. In another setting, it could have been mistaken for a snowboard ramp. But the students applied a coat of yellow “paint” — sprayed-on food coloring — to it, and then in blue, the formula for the area of the triangle formed by the side, A = ½ bh. All around the schoolyard, cylinders, circles, and rectangles rose out of the snow, embellished in bright colors with formulas for area and volume. Three students carefully carved out a particularly well-known formula, Einstein’s expression of the relationship between energy and mass, E = mc2, coloring it red, yellow, and blue. Imagine putting such inventiveness to use in math class, solving problems in the snow. Or writing out spelling words or new vocabulary in French, Spanish, Mandarin, or Latin in food coloring. 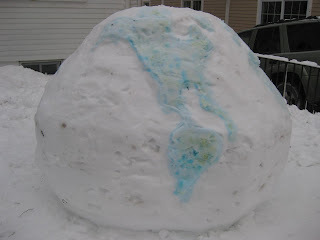 When Ursula and Virgil saw the article in the paper, they immediately hatched a plan to decorate their snow fort with food coloring from our pantry. Because of course Brummel knew that his students were getting more than science lessons. They were learning how to be creative outdoors — a lesson, Brummel noted, that they can use the rest of their lives. And you don’t need to be in school to use that lesson. • Read the Valley News article (“Playtime, Class Time” by Katie Beth Ryan). To see bigger photos of the snow formulas, however, you'll need to go to the paper's photo gallery and click on the photos for January 18. Photo of a "snow globe" in Somerville, Mass. Credit Andy Metzger.